Today we sit down for a chat with Detective Douglas Milligan from author F.M. Meredith’’s Rocky Bluff P.D. mystery series. What was your life like before your author started pulling your strings? Being a police officer is the most important thing in my life. I lost my first wife because she wanted me to give up my job—something I don’t ever want to do. What’s the one trait you like most about yourself? I never give up. When I’m trying to find the bad guy, I’ll do whatever it takes to track him or her down. Lately, I’ve allowed family problems to distract me. But I’m not convinced that’s such a bad thing. What is the strangest thing your author has had you do or had happen to you? In this book, it has to do with what I mentioned about a family matter distracting me. Never before while in the midst of a murder investigation, have I let something happening in my family take my mind off an investigation. However, in this case, I believe it was justified. Do you argue with your author? If so, what do you argue about? I wouldn’t call it arguing, but I do let her know what I will and won’t do. After all, I’ve dedicated my life to protecting the citizens of Rocky Bluff, and I’m not going to let her forget that. Losing one of my family members and not being the best husband and dad possible. #1 has always been solving a case. However, with what happened recently, I have to say knowing my family is safe. If you could rewrite a part of your story, what would it be? Why? Years ago, when I first started out, I would have liked to been able to save my best friend from dying. Of the other characters in your book, which one bugs you the most? Why? In the past, I would have said Officer Gordon Butler. He was such a dufus at times. However, he’s matured, and a lot of the credit goes to his wife Lizette. In this particular book, a change in my daughter Beth bugs me the most. Of the other characters in your book, which one would you love to trade places with? Why? No one at the moment. In most ways, life is good. I love my family and my job. Tell us a little something about your author. Where can readers find her website/blog? Marilyn writers this series as F. M. Meredith. 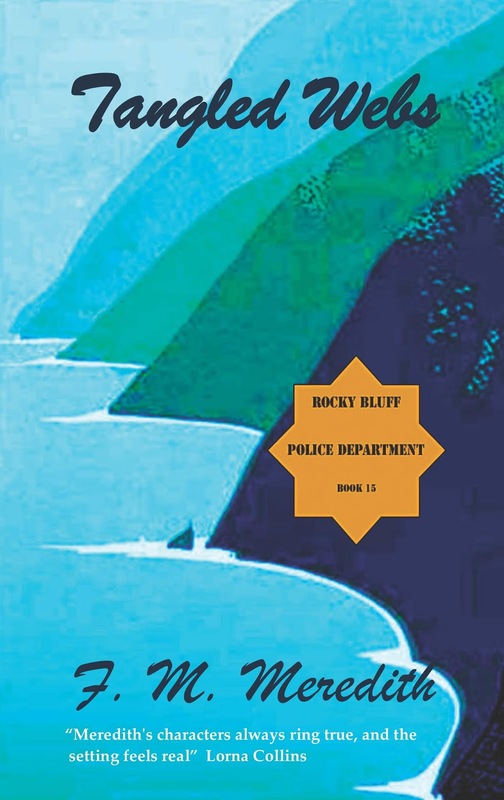 She once lived in a beach town much like Rocky Bluff. She has relatives and friends in law enforcement. She’s a member of MWA, three chapters of Sisters in Crime and serves on the PSWA Board. The number of books she’s published is pushing 40. You can find more about her at her website and blog. This is the final blog stop on Marilyn’s tour for Tangled Webs. She hopes you enjoyed following along. I plan on continuing my career in law enforcement. I can’t imagine doing anything else. My family and I have no plans to leave Rocky Bluff. When the next murder comes along, I’ll do my best to find out who did it. With two children in my home, one a teen, I can’t even guess what might happen next. Whatever comes along, I’ll take care of it the best I know how. Too many people are telling lies: The husband of the murder victim and his secretary, the victim’s boss and co-workers in the day care center, her stalker, and Detective Milligan’s daughter. Thank you so much for hosting this interview today. I hope people enjoy it! I'm sure they will, Marilyn. It's always a pleasure to have you join us. Very nice hearing directly from Detective Milligan! "The Rocky Bluff gang," as I call them are a very enjoyable and comfortable set of characters I like visiting with. I have Tangled Webs, but waiting for the perfect day to curl up and read their latest adventure. Great interview....Detective Mulligan really respects you. Loved it. What a unique idea doing an interview with your character. It really brings him to life and shows that these creations are more "flesh and blood" than we realize. I read the book and loved it, and I love learning how Milligan feels about life and his job. Thank you for sharing! I was gone all morning and how fun to come back to all these comments. Thank you, Jim, for stopping by--hope to see you at the next PSWA Conference. Madeline, I had fun answering the questions for Doug. And thank you, Ela, for stopping by. To me Milligan is very real. Since Anonymous told me who he was, I want to say I had fun doing this for Detective Milligan. And Marja, thanks for leaving such a nice comment, I appreciate it.